I’ve learned from other researchers that a tombstone may include personal information about the deceased. And it may yield some important genealogical clues. But what to make of the details I am still learning. I don’t read Hebrew and need to rely on the generosity of others to translate text carved in stone. I believe that the woman buried here is my 1 cousin 3x removed. Or she may be related to me, but from another branch of my family. A copy of her marriage to Maurice Littman states this is her 2nd marriage with her first to a Mr. Goldberg. My question today was what the engraving on the headstone is, and will it help me to confirm a relationship with her. I posted the query on a Facebook group called Tracing The Tribe and was the translation reads: Sarah the daughter of Mr. Israel Yaakov. Ok, as I also learned that Hebrew inscriptions often only include the patronymic name. And the patronymic name Yaakov does translate to her father’s name Jacob….but I’m no closer to knowing a confirmed relationship with her. 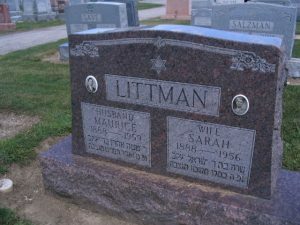 But I’ve learned more about Jewish tombstones. Apart from a known relationship with her I’d like to know if she had children, and most likely from her first marriage. I know I have DNA relatives with the surname Goldberg.